Have you seen Chladni figures? They're patterns made when sand is exposed to sound waves on metal plates. They can be amazingly intricate. And now scientists could be making them with living cells. Put a grain of sand on a frantically vibrating plate and it will hop off. Put it on a still plate and it will stay where it's put. Due to the miracle of sound, the vibrating plate and the still plate can be the same. Sound waves, properly combined, vibrate frantically at antinodes, but are still at nodes. By tweaking the power and frequency of the vibrations, the nodes and antinodes can change their location and their pattern. Scatter sand on plates and you can see a variety of different patterns. Scientists have realized that this doesn't have to be confined to a metal plate. 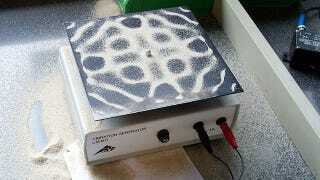 Place cells in a substrate and vibrate that substrate with sound waves, and those sound waves can push cells around. That's what new "acoustic tweezers" do. Researchers can carefully place four "acoustic sources" around a substrate in a container, and tune their power and frequency to make precisely placed nodes and antinodes. Just like the sand, cells will naturally slide to the non-vibrating parts of the substrate. There are various forms of wave-based tweezers. Many researchers use optical tweezers, which utilize lasers. But lasers come with heat and energy, which can damage fragile cells. Acoustic tweezers are comparably gentle, but can still move cells into complex patterns or hold them still to be studied.